Following a one-day strike in early February and just days before a three-day strike was set to begin, the University of Southern California conceded on all the major issues raised by 800 NUHW members at USC’s Keck Hospital. 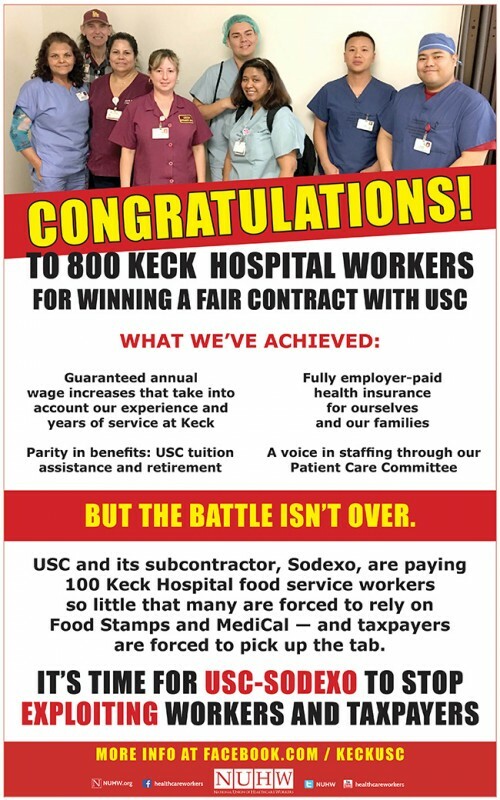 “Eight hundred USC Keck workers forced USC to adhere to its own rhetoric by making them full members of the Trojan family, both by compensating them fairly and by granting them a voice in the hospital’s staffing and patient-care policies,” NUHW Secretary–Treasurer Sophia Mendoza told USC’s Daily Trojan newspaper. One hundred NUHW members at Keck–USC are employed by Sodexo, a subcontractor that provides food service for the hospital. USC, one of the wealthiest private universities in the nation, is hiding behind Sodexo to deny responsibility for the poverty wages and inadequate benefits given to USC–Sodexo employees. For the video and an update on the USC–Sodexo campaign, click here.